One of the main reasons why I like spring is cherry blossoms. Cherry blossoms have special meanings in Japanese culture, these are seen as a metaphor for life. A noble, beautiful blooming followed by the inevitable fall. At this time of the year in Japan, we have a lot of ‘cherry blossom viewing party’. Drinking, eating and singing under the cherry blossom trees, appreciate and celebrate the beauty of cherry blossoms. Japanese people are still having a very sad and hard time, but I believe that cherry blossoms lift their spirits. Cut the flowers (with the short stems), wash them gently in cold water and drain. Toss the blossoms with the salt, place the salted flowers in a plate, cover with cling film and place a weight on the top of it to force out excess water, then leave it for 2 days. 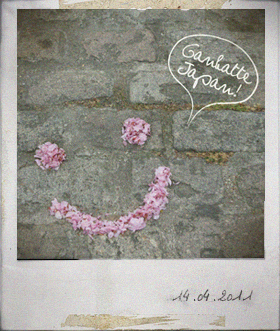 Drain the water, and pat dry the flowers with kitchen papers. Place the flowers in a small bowl, sprinkle them with the vinegar, cover with cling film and place a weight on the top of it again, and leave it for 2 more days. Drain the vinegar, pat dry the flower with kitchen papers, toss the flowers with the sea salt (for preserve) and store them in a small, clean jar. 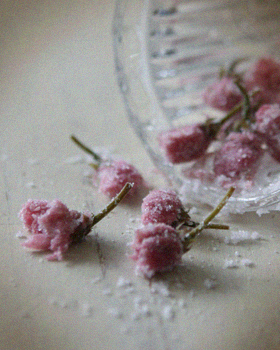 Place 8-10 salt-preserved cherry blossoms in a bowl with 420ml water, leave the flowers for 10 minutes. Take out the cherry blossoms from the water, wring water out of the flowers (keep the water in a bowl for cooking rice*). Pour the water in a bowl* in the pan and cover with tight-fitting rid. Finely cut the cherry blossoms and green olives. 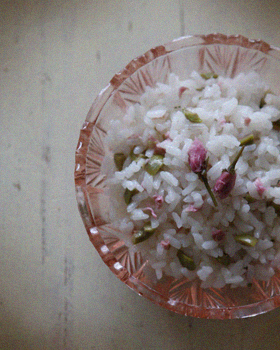 Mix the cooked rice, cherry blossoms and green olives together. You are currently reading Cherry Blossom and Green Olive Rice at Fish Trip Cafe.